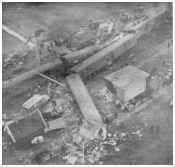 Holland's worst-ever rail accident occurred on a foggy morning in the middle of the winter of 1962. At a lonely junction near Woerden, two trains collided with catastrophic effects. Railway lines where bi-directional running is permitted are inherently dangerous. For this reason, on single lines very complex arrangements are put in place to control traffic and ensure that two trains do not meet each other coming from opposite directions. Such arrangements include train orders, staffs or tokens and on today's modern railways, electronic tokens. These provide a double check on a train's movements.For not only must a driver obey signal indications, he must also be in possession of the correct authority before proceeding onto a section of single track..
On double-tracked lines, each track normally carries traffic in one direction only. Thus, any danger of a head-on collision is eliminated. However, there are occasions where running on the "wrong" line is permitted. In these situations the checks used on single lines are not present. Only the normal signals exist to prevent trains coming together. It is essential that drivers taking trains over these stretches of track exercise the utmost caution with regard to sighting signals. It is common, at junctions where high speeds are to be maintained for them to be engineered to avoid diamond crossings. Layouts are installed which require a train to transfer to the opposite running line before branching off onto another line. Because of their step-like appearance they are sometimes referred to as "ladder junctions". Just such an arrangement existed at Harmelen. Here, the line from Amsterdam leaves the mainline between Rotterdam and Utrecht. For a short distance, Amsterdam trains crossed over from the eastbound line to the westbound line before being diverted onto the Amsterdam line. It was shortly before twenty past nine in the morning of Monday January 8, 1962 when a train bound for Amsterdam was snaking through the junction. Consisting of two electric multiple units it was moving at about 45 mph. The manouvre was protected from oncoming train by a red signal on the approach to the junction from the Utrecht direction. A Utrecht to Rotterdam express train, headed by an electric locomotive, No. 1137 and travelling at about 60 mph was approaching the junction. Perhaps because of the foggy conditions, the driver missed a yellow light warning that the next signal was at red. It must have been at the last moment that he saw the danger signal. The driver applied the brakes but there was nothing more that he could do. Collision was inevitable. The lead car of the EMU was about to enter the turnout from the main line when the locomotive of the express struck. The superior weight and speed of the express loco ensured that the more lightly built car was pushed to one side. The express ploughed on through the EMU, bringing down the overhead powerlines and eventually destroying 6 of the Amsterdam train's coaches. Three of the coaches of the express were also destroyed. Between them, the trains were carrying about 500 people. A total of 91 of them including the drivers of both trains lost their lives. I would like to express my thanks to Dolf Wiertzema who supplied the pictures and much information for this article. Dolf, who lives in Groningen in the Netherlands has a partivular interest in the Harmelen disaster. His father was a conductor on the railways and a train which he was on had passed the junction just half an hour before the collision. At 7.09 pm an incoming local passenger-train from Nieuweschans (near the German border) collided in the yard with a shunting goods-train. An instruction from the guiding shunter to the goods-train driver to accelerate his train, in spite of a stop-signal, caused the accident. Three people were killed, five wounded.